The creation of the Wirehaired Vizsla started in the 1930s. It was noticed that some Vizslas had thicker coats which gave them better protection in cover and water. One of these thicker coated females was crossed with a German Wirehaired Pointer. The breeder who did this was Mr. Vasas Jozsef. He tried two such matings with the same male and different females. 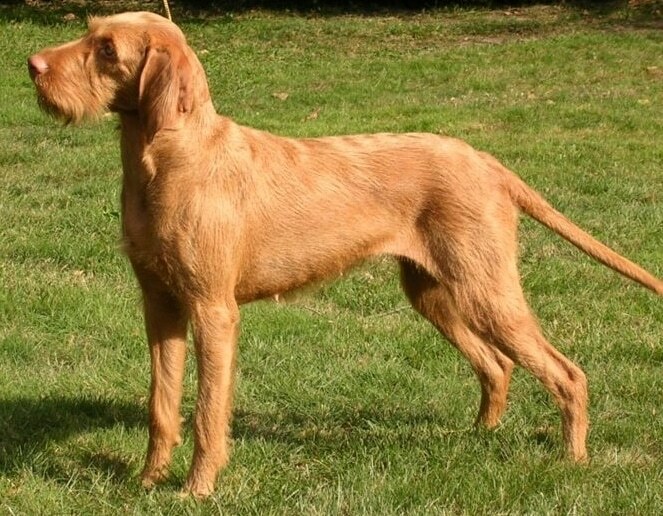 The Wirehaired Vizsla has two cousins, the Smooth Vizsla and the other, a rare longhaired Vizsla. The longhaired can be born in both smooth and wire litters, although this is quite a rare occurrence. Wirehaired Vizslas are known as excellent hunting dogs, and also have a level personality making them suited for families. The Wirehaired Vizsla is a versatile, natural hunter endowed with an excellent nose and an above average trainability. Although they are lively, gentle mannered, demonstrably affectionate and sensitive, they are also fearless and possessed of a well-developed protective instinct. The wirehaired Vizsla breed is an excellent retriever, and has the determination to remain on the scent even when swimming. The overall appearance embodies the qualities of a multi-purpose pointing dog, endurance, working ability and an easily satisfied nature. Wirehaired Vizsla's are a drive in the field, yet is a tractable and affectionate companion in the home. •	Loyal, Caring and very affectionate. •	Quiet, only barking if provoked. •	Natural hunters, quick to train. •	Great Pointers & Excellent Retrievers. •	Love to retrieve on land as well as water. •	Sensitive Temperaments and do not respond well to harsh training techniques. •	Thrive on attention, exercise and interaction. •	Highly Intelligent, love a challenge and to be stimulated mentally and physically. •	Can be destructive and become depressed if left alone. Wirehaired Vizslas, like their cousin the Vizsla, are energetic working dogs with enormous stamina. It needs to be taken on daily, long, brisk walks or jogs. In addition, this breed needs plenty of opportunity to run, preferably off the leash in a safe area. If these dogs are allowed to get bored, and are not walked or jogged daily, they can become destructive and start to display a wide array of behavioral problems. Keen and trainable to a high degree, it needs daily mental stimulation. It needs a patient, calm, firm hand. If it does not see you as a strong authority figure it will become stubborn. Good with children, this breed loves to play for hours. Without extensive daily exercise it may be too energetic and excitable for very young toddlers, but is excellent for energetic kids. Able to adapt quickly to family life, and is generally good with other dogs. Wirehaired Vizslas are very athletic, and when lacking in exercise they may become destructive or neurotic. Socialize them well to people, places, noises, dogs and other animals. It is very important to obedience train your Wirehaired Vizsla. Without enough exercise, it can be overly eager, prancing around you in sheer excitement. This breed is highly trainable and very willing to please; if you can get it to understand exactly what it is you want of it. If you do not train this breed it may become difficult to handle and control. Example: See Video of a Vizsla that needs more exercise. Notice how very eager to please the dog is, yet has more built up energy than she knows what to do with. She is obviously stressed and not relaxed. Wirehaired Vizslas tend to chew. This breed is not for everyone. If you want a calm dog and are not willing to walk a couple of miles or jog at least one mile a day, do not choose a Wirehaired Vizsla. Without proper exercise, this breed can easily become high-strung. They have many talents such as: tracking, retrieving, pointing, watchdog and competitive obedience. The Wirehaired Vizsla is a hunting dog and may be good with cats they are raised with, but should not be trusted with animals such as hamsters, rabbits and guinea pigs etc. Be sure to always be your dog’s pack leader to avoid any negative behaviors such as guarding furniture, food, toys, and so on. Well-balanced Wirehaired Vizslas that receive enough exercise, and have owners that are true pack leaders, will not have these issues. These behaviors can be reversed, once the owners start displaying leadership, discipline, and provide enough exercise, both mental and physical.